Talking to Advisors has never been easier! Simply choose the Advisor you’d wish to speak to, click “Call Me” and voila - you’ll get a call on your phone from your Advisor of choice! How does Call Me work? Where can you find the Call Me button? Why does it say “Get a Return Call” instead of Call Me? What if you miss your phone call? Can you schedule your call for a later time? Can you receive your call on a different phone? 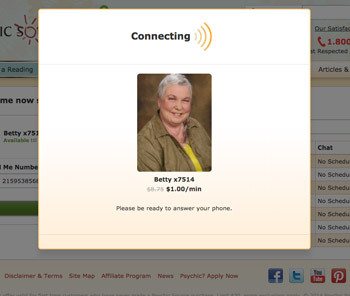 Log into your online Psychic Source account and click “Call Me” on the available Advisor of your choice. By default, we’ll use the phone number listed on your account. If you prefer to receive your call on a different phone, enter the country code and phone number when prompted. Your phone will ring. Answer the call and you'll be placed on a brief hold while we connect you with the Advisor you selected. Enjoy your reading and remain on the line afterwards to rate your Advisor. Make sure your Caller ID Block is OFF and that you are able to receive calls from toll-free numbers. On each Advisor’s bio page, to the right or below their photo. On the Advisor Full Listing page, below their rate. On the Favorite Advisors Page, to the right or below their current status. If the Advisor is already in another reading or logged off the system, the Call Me option will not be available. Fortunately, you simply click on “Get a Return Call” to speak with this Advisor at a future time using our Return Call feature. What if you miss your phone call from the Advisor? Simply try the Call Me feature again and we’ll call you back. It’s possible that when you began the “Call Me” process, the Advisor was available, but became unavailable immediately after because another member was trying to reach the same Advisor at the same time. If this happens, just click on “Get a Return Call” and receive a Return Call as soon as the Advisor is available to speak again. Unfortunately, no. Please wait to use this function until you’re ready to talk. Yes! When you select Call Me you can always change the phone number we will call you at. It does not have to be the same number on your account.